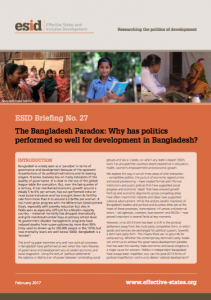 Effective States » The Bangladesh paradox: Why has politics performed so well for development? The Bangladesh paradox: Why has politics performed so well for development? This briefing paper examines why and how political processes in Bangladesh have performed so well when the main theories of governance and development would predict economic and social stagnation. Using a political settlements lens (“… the balance or distribution of power between contending social groups and social classes, on which any state is based”) ESID’s work has analysed the country’s recent experience in education, health, women’s empowerment and economic growth.